Once you’ve started reading this article, the question - which one is better in the competition Wix vs Squarespace vs Shopify - is really something you do not know. 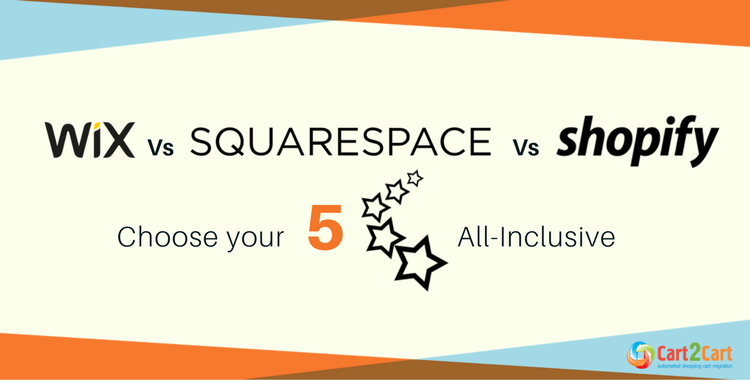 Is Squarespace better than Wix? Why is Shopify popular? You’ve came across the right article and the issue will be more than clear in a few minutes. Just keep reading! Why should you even bother with the difference? Because choosing the platform for starting online business would have a lot of consequences - both short- and long-term. In the short run, once you’ve made the right choice, you save much time creating it. In the long perspective, you’ll benefit from great functionality. In simple words, if you’ve succeeded - you are happy and rich, once failed - you’ll suffer until you migrate to another platform. Wix, Squarespace, and Shopify have much in common: all the three platforms are absolutely easy-to-use and extremely user-friendly. There is no need to have any tech skills to launch and manage online store. All you have to do is to register an account. Do not worry about any technical aspects - with hosted solutions they are taken care of. Key difference among the three is that Wix and Squarespace were initially created as website builders to support content based websites. Shopify - is a pure eCommerce platform created for online shops. Wix is one of the most popular drag-and-drop website builders. Using it you can create an e-store in a few seconds and start selling limited number of products in a split sec. Squarespace is very easy-to-use. It was designed for blogging and currently allows selling products after connecting payment processor. Shopify was initially designed an eCommerce platform. It was created and adapted to launching online stores. This is it! The major difference between the three solutions - Shopify is meant to be used for selling online and offers advanced eCommerce capabilities by default. Let’s dive into functionality of the three platforms to get more details! Wix, Squarespace and Shopify are the three solutions that are absolutely user-friendly and easy to maintain. You do not need any particular tech skills to make the necessary configurations. Wix comes as the easiest and would be great for beginners. The latest version of Squarespace is much simplified if compared to the previous one and requires no effort to launch. Shopify is easy-to-use with intuitive interface, managing web-store is effortless with Shopify. Another advantage - with hosted solutions there is no need to take care of the updatings. You can concentrate on your business and not dive into technical aspects. Choosing hosted solutions for selling online is like buying a house. You pay for the building and customize it the way YOU like. Paint the walls, set security, get it furnished, order devices to make the life comfortable and so on. You avoid all the hassle of creating something from scratch. Opting for a hosted shopping cart for a store is virtually the same - you have the structure and personalize it taking care of the nuances. As for the templates and designs in the competition Wix vs Squarespace vs Shopify there is no clear winner. All of them have fabulous, elegant, up-to-date and responsive designs adapted to different gadgets. 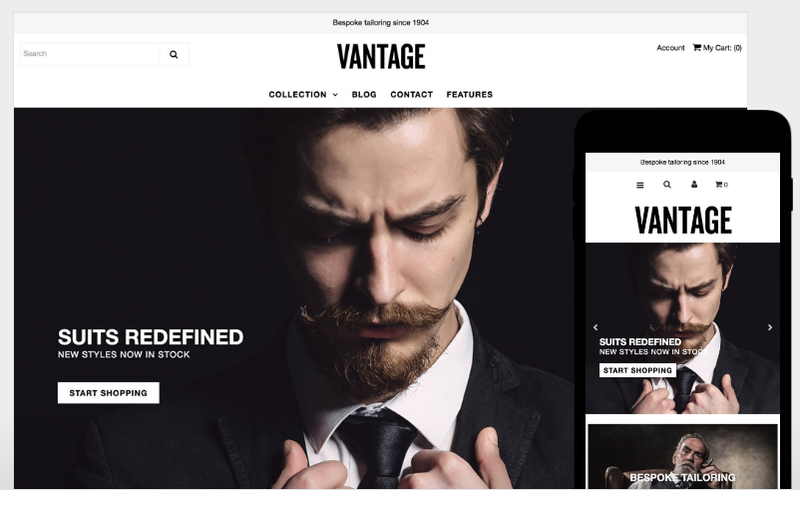 Wix suggests 510 stylish templates (including 73 templates for online stores). 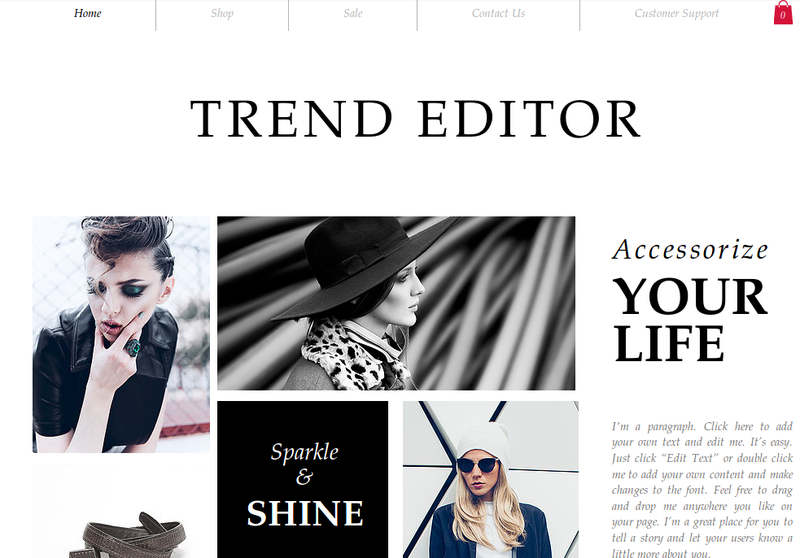 Wix templates are really creative. You’ll hesitate much which one to choose - all of them look appealing. The number of Squarespace templates is a bit lower (40 designs), their quality is high and they are responsive. Plus, they could be personalized to the fullest. 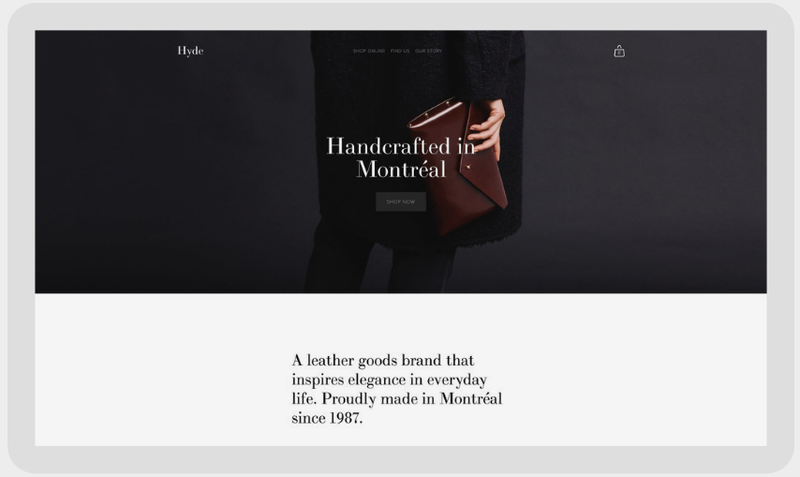 Squarespace offers an option of Cover Pages (there are currently 26 options to choose from) and it might rise your webpage to new level of style. With Squarespace you’ll receive high quality designs. Depending on the chosen template, you'll get many awesome visual effects in play, including parallax scrolling and text that gracefully fades in and out when users scroll through a site. Shopify has over 100 designs both free and premium. They are stylish, elegant and more customizable if compared to Wix and Squarespace; the paid themes price varies from $140 to $180. Do not get afraid of the charge, it is a one-time payment that will benefit you hundred times in the long run. If your budget is limited, there are great, responsive free templates that will be smart alternative here. Wix is fairy flexible. It has some restrictions on customization peculiar to hosted solutions, except Shopify. The main issue you might face with Wix is that once you choose a theme, you will not be able to change it. Wix comes as a great option for portfolio web pages, small businesses and personal blog. In this cases the option of changing design might be not crucial. Once you are satisfied with the template chosen the additional features of Squarespace and Shopify might be unnecessary. Squarespace allows editing CSS and only certain bits of HTML. Important to mention that Squarespace support team reserves the right not to sustain you fully if you edited CSS to your website. Among the three Shopify is the most flexible as it gives you full control over HTML and CSS of your website. You’ll be able to create absolutely unique site. Wix App Market has a variety of advanced tools. They will enable you to add functions to your site (booking, testimonials, pricing tablets, email marketing). Among the 260 apps that are offered most of them are 1-click installs; all the integration works are done already with Wix. The lack of native apps in Squarespace is its major disadvantage. This solution doesn't have native extensions. All the plugins are developed by 3rd parties that can’t guarantee their security and high quality. Users often complain on the issue on eCommerce forums. Once you feel 3-rd party plugins put the security of the whole website at risk - you can always migrate your store from Squarespace to Shopify. Shopify App Store has impressive number of extensions (over 1,200). Pay attention that major part of them are designed for boosting sales and creation of effective marketing campaigns. There are apps on optimization your order and inventory management, enhancing payments and security, advanced analytics etc. 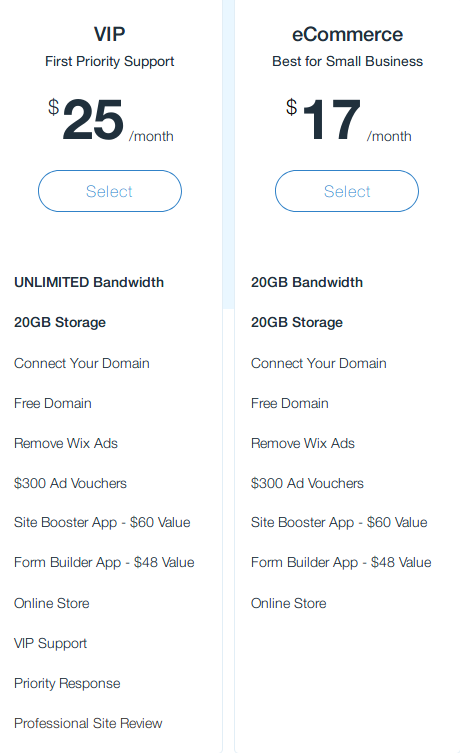 Wix pricing is fair. There are 5 payment plans to choose from, only two of them - Vip and eCommerce - enable you to launch an online store. To get started go to Wix official website. Both Squarespace and Shopify have 14-days free trial version. It is a fair opportunity to check whether a particular platform will suit your needs and expectations. 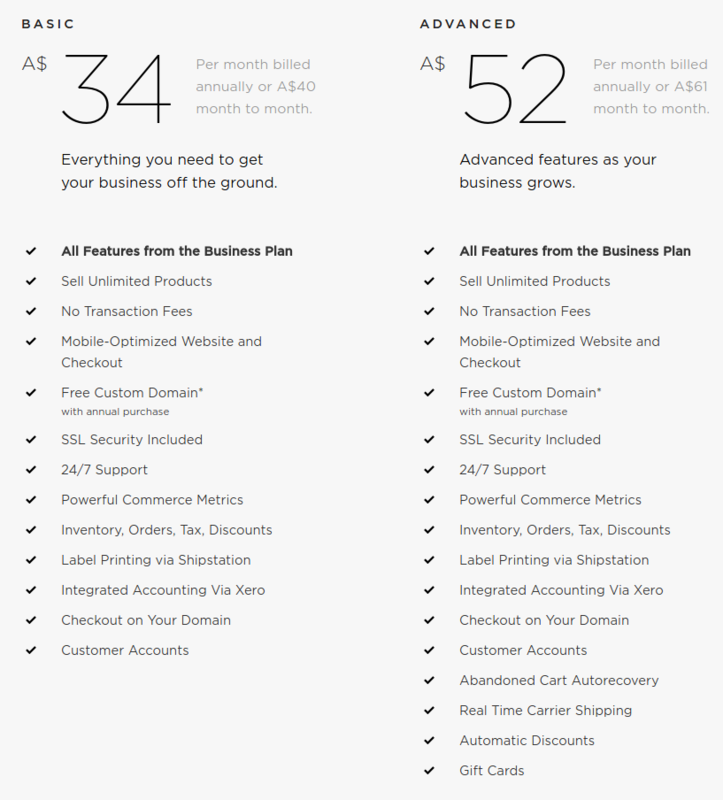 Squarespace offers 4 plans to choose from. The price comes a bit higher than average on the market. Once you check the capability the platform offers you’ll see that pricing is fair. If you are ready to build a store with this solution, start Squarespace free trial now. 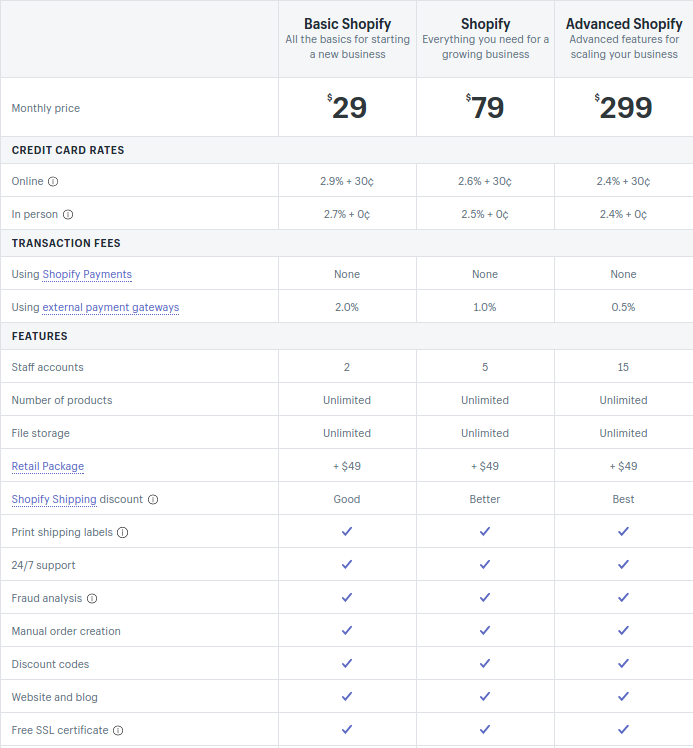 Shopify offers 3 plans and you can save up to 20% if you choose 1- or 2-years subscription. All the plans enable selling unlimited products and using the advanced eCommerce functionality - Facebook Store / Facebook Buy Button / Pinterest Buy Button / Twitter Buy Button / Point of Sale and all of useful Shopify integrations. Once Shopify looks appealing to you start Free 14-days trial. Once you own an e-store, the range of most popular payment gateways is simply a must. When your client has decided on a purchase he or she should have all the means to transfer the money. In this aspect Shopify comes is a lucky ticket offering over 100 different payments gateways, including most - PayPal. Wix offers only 17 payments gateways. It is much less that Shopify, it not the most significant issue - the most widely used PayPal and Authorize.net are included. Squarespace offers 6 payment gateways including most popular ones: PayPal, American Express, Apple Pay. They are widely used and would be enough once your store is not very big. Squarespace were designed as website builders. They have some basic features, if you dream of an advanced e-store, if you sell physical or digital products - Shopify is your perfect match. If you already running your store on Wix which offers quited limited eCommerce functionality we suggest you to switch from Wix to Shopify. With Shopify you will be able to offer your client discount coupons, vouchers and certificates. Integrations with Amazon, Facebook, Pinterest, Facebook, etc. The chance that your client will know the exact name of your webstore is low; great ranking in Google is crucial nowadays. What’s point in having a website without visitors? In terms of SEO, Shopify is real winner. 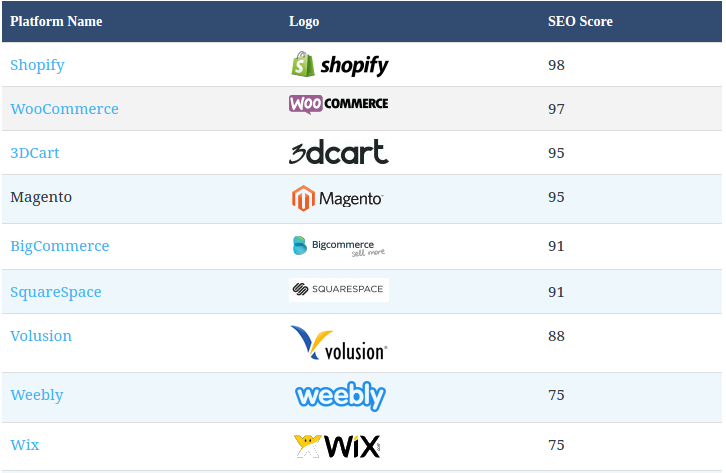 According to Wix and Squarespace SEO capabilities they take lower places: Squarespace is 6th and Wix 9th respectively. Why is Shopify leading? Because it offers 100% crawlable, clean code customization of page titles, meta descriptions, image alt texts, and a variety of free and paid plugins, that you can find on official marketplace, designed to boost your position in Google. All the three solutions offer extensive support and vary only by the means you can reach Support Team and time periods they are available. Wix Customer Service is provided by Help Center. There is a variety of topics you can choose detailed instructions to. Plus there are many video tutorials. If you can not find the ans wer yourself you can reach support by mail or phone from 6am to 5pm PST. Squarespace and Shopify are a bit more advanced concerning support. Squarespace offers assistance by email and live chat, though it is available between 4AM and 8PM Eastern Time, Monday till Friday and a huge base of video tutorials and workshops. Shopify provides its customers professional assistance 24/7 via live chat, phone calls and emails. You can easily find the required answers in Shopify Help Center and visiting their Forums. Support here is really advanced. In the battle Wix vs Squarespace vs Shopify there is no absolute winner. The choice of the particular platform will be reasonable if you consider the peculiarities of your business and the goals you are willing to achieve. All the three solutions are easy-to-use. They have beautiful templates to choose from, are flexible and fairly priced. Wix and Squarespace are website builders by default and have limited capabilities in terms of SEO and eCommerce. They will be absolutely winning for creative minds - photographers, designers, artists, event managers. If you strive to build a robust e-store you need a strong alliance, then Shopify is the platform you need. Explore key benefits of Shopify import. Already having a website on Wix or Squarespace? If you consider this a problem, please don’t. Migrating to an advanced platform with Cart2Cart is a matter of 3 simple steps. To get more information on Migration from Wix and Squarespace follow the links - Wix Migration and Squarespace Migration. Free Demo is a great chance to see how your website will look on new, enhanced platform. Even if your e-store is based on some other platform you have a great chance to migrate to Shopify with Cart2Cart Automated Migration Service that supports transfer for more than 80 carts. Use your chance to get highly-flexible store in a click. Start Free Demo and check the advantages of automated switch right away! 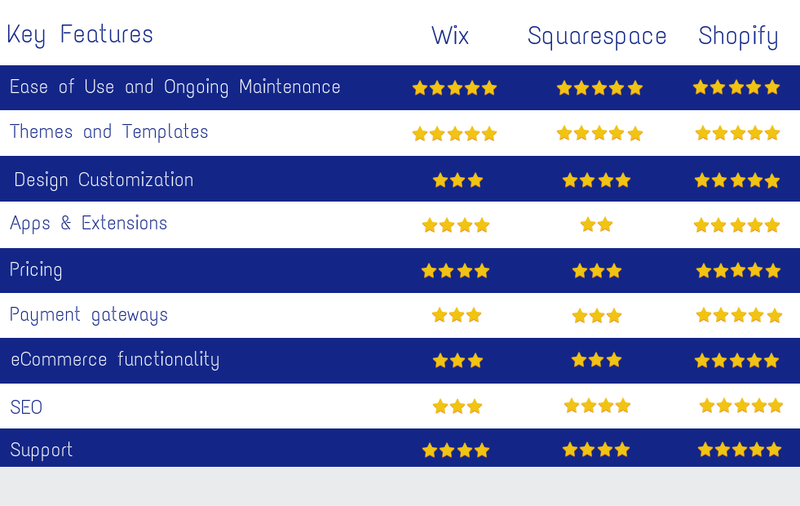 4 thoughts on "Wix vs Squarespace vs Shopify - Choose your 5-star All-Inclusive"
Thanks for the great information. I did a lot of research before choosing and your article helped me a lot! Thank you very much for the nice words! I worked hard to compose a comprehensive review and I’m happy you like it. Our blog is full of such articles. Don’t forget to share the posts you like most of all! Thanks for your feedback. Please, share your opinion with us and don’t forget to share the posts you like most of all.